I am currently working on a series I call Visionary Poetry. It is a give-and-take process where I create the vision based on a poem written by Joyce Stein. Or I create the vision and the poet responds by writing a poem based on the art piece. 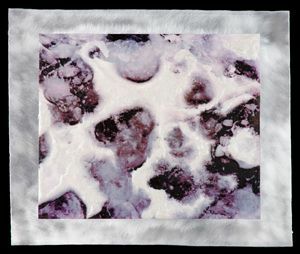 The images are created on the computer, printed on canvas, presented on brushed aluminum and finished as an encaustic painting. 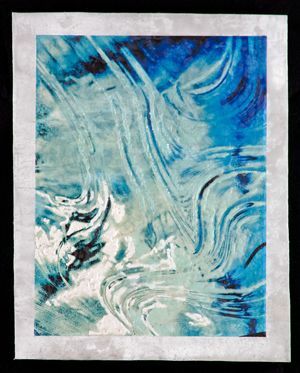 The encaustic adds a feeling of mystery with a balance of transparent and opaque areas. Poetry makes the reader experience through the verse and its rhythm the thoughts and feelings of the poet. The words chosen are based on the poet’s reaction to the visual impact of the art piece. Words have their own color and shape and I react to them with my individual vision of their meaning. The art piece and the poem are designed to complement each other. Each painting is accompanied by an audio recording for the viewer to listen to the poem while viewing the painting. Some viewers and readers may find their own interpretation of a specific combination and that adds even more to the viewing. Diane Destiny received her MFA Degree from California State University, Los Angeles. Since graduation she has taught at Mission College, CSU Northridge, Polytechnic, Pomona and CSU Los Angeles. She has had eight one-person exhibits, the last in Bergamot Station, Santa Monica. 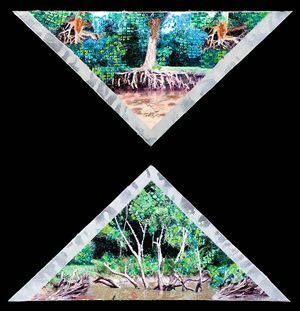 Destiny has also exhibited her work in numerous competitive and invitational annuals and group exhibitions. She has received an Annual Juried Exhibition of Works on Paper Purchase Award from Brand Library Art Galleries and an Annual Westwood Art Association 1st place cash award. In addition, she has won other prizes and awards. She was also awarded a Sculpture Commission for Southern Colorado State University in Pueblo. Her work can be found in the following publications: Feminists Who Changed America, 1963-1975; The International Library of Photography, Priceless Treasures, 1999; Visions Art Quarterly, 1993/94; and Guide to Artists in Southern California Art Resource Publication. Her work is in permanent collections at the National Museum of Women in the Arts, Washington, DC and the Brand Library, Glendale, CA.